As the colorful eyeshadow trend seemed to build and build over the summer months, Coloured Raine came out with their own iteration of pressed pigments, which are so incredibly vibrant and intense. I played with the blues, inspired by Absolem the caterpillar from Alice in Wonderland, and created an accompanying delicious autumn "drink me" potion I think he would approve of. Eyes: Coloured Raine Vivid Pigments. 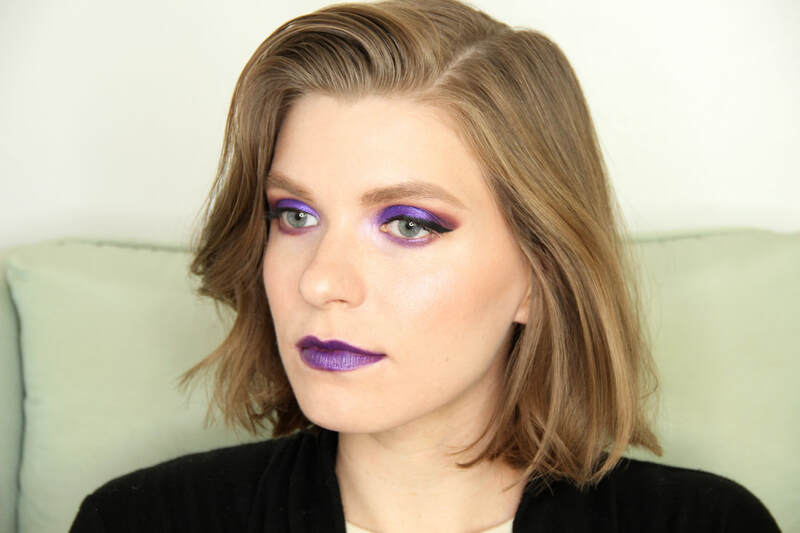 Lips: Necromancy Cosmetica Lipstick in "Morgue" + Coloured Raine Vivid Pigment in "Yacht Life". Coloured Raine Vivid Pigments, $7 each, come in 16 rich matte shades. All are vegan with the exception of "Unbothered", which I replaced with the shade "Gumby" to round out the greens. They also offer all 16 pigments in palette form for $50. These eyeshadows truly live up to their name. They pack a serious color punch and surpass all of the other bright eyeshadows in my collection in pigmentation and blendability. If you like colorful looks, these are a must. This recipe embraces the color changing magic of butterfly pea flower tea, which is a striking blue until anything acidic is added, and then it turns into a gorgeous rich purple. The combination of the tea with cider makes this a perfect fall drink. Prepare hot butterfly pea flower tea. Set aside and watch the blue color do its magic. Heat apple cider on the stove until steam begins to rise, and pour the cider into the tea. Stir in agave nectar and a splash of lemon for the finishing touches. Enjoy! 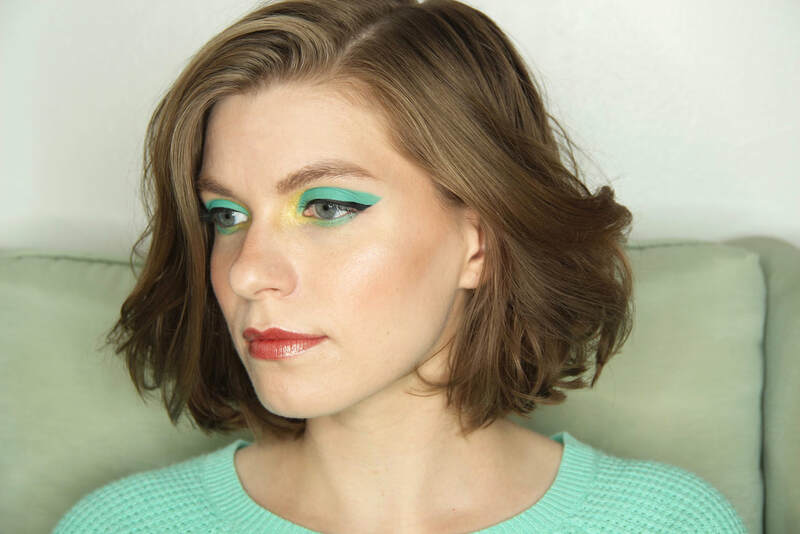 The Block Party Palette is the first thing I've tried from Suva Beauty. I love how vibrant the colors are, and though it's a summer collection it transitions really well into fall. Also pictured is the aptly named Summer Dying Fast Collection from Necromancy Cosmetica. And as always, both of these products are vegan and cruelty free! 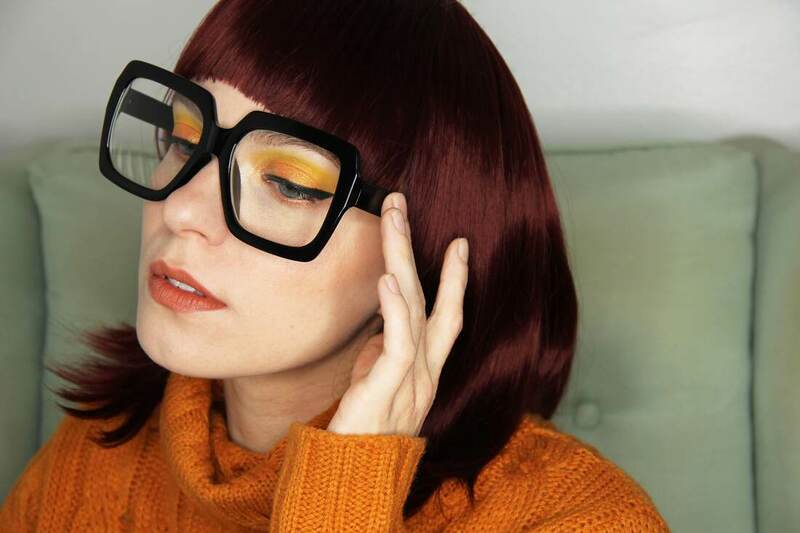 I thought together the palette and lipsticks would work nicely for my attempt at a glam version of Velma Dinkley. And what Scooby Doo themed look would be complete without some zombies? Zoinks! Scroll down for the recipe for vegan and gluten free oatmeal cream pies, made extra spooky with matcha and pistachios. 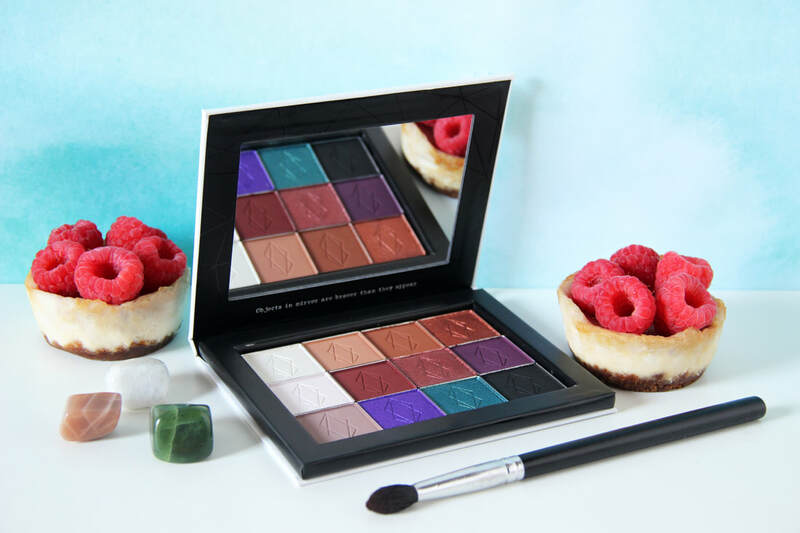 Eyes: Suva Beauty Block Party Palette . 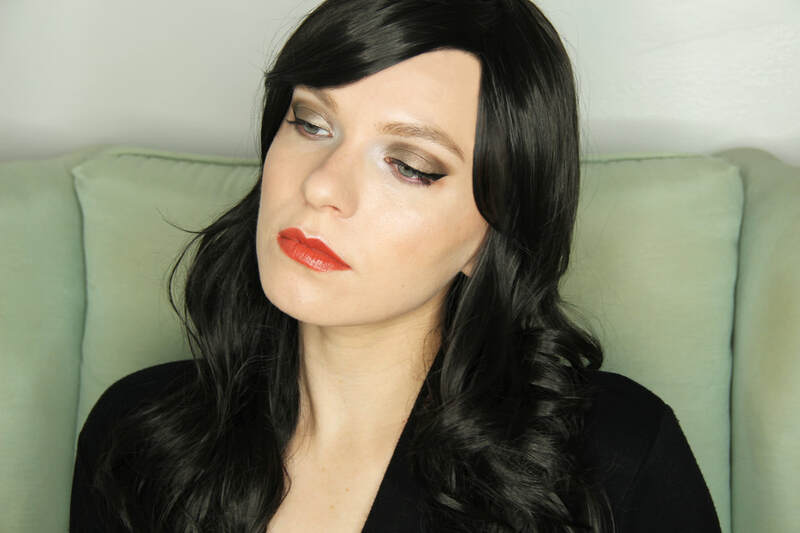 Lips: Necromancy Cosmetica Lipsticks in "Mourning Rose" + "Solis Mortem". 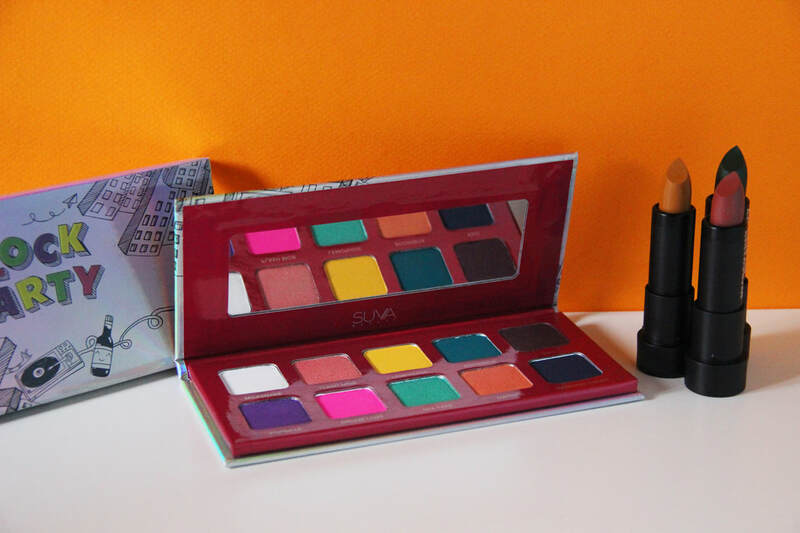 The Suva Beauty Block Party Palette, $30, includes 10 eyeshadows (5 matte, 5 metallic) "for the bold, wild and playful". 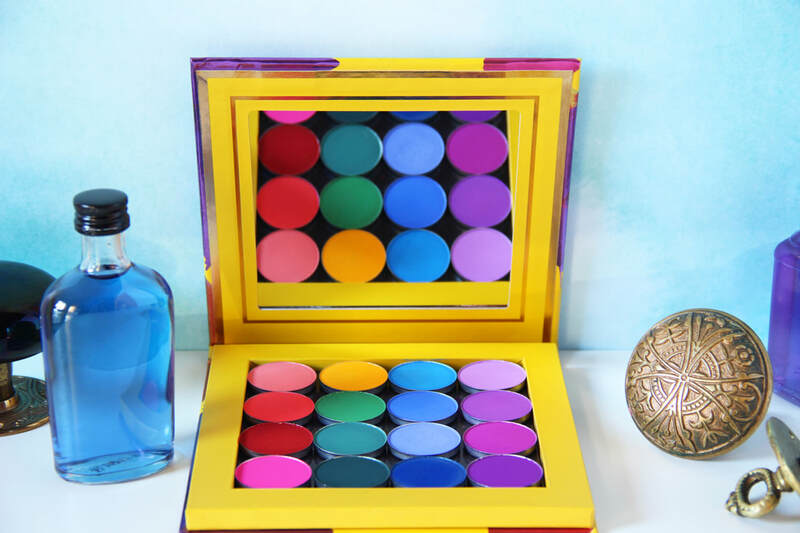 The combination of shades in the palette looks exactly like my 90's Gymboree dream wardrobe, and I love it! 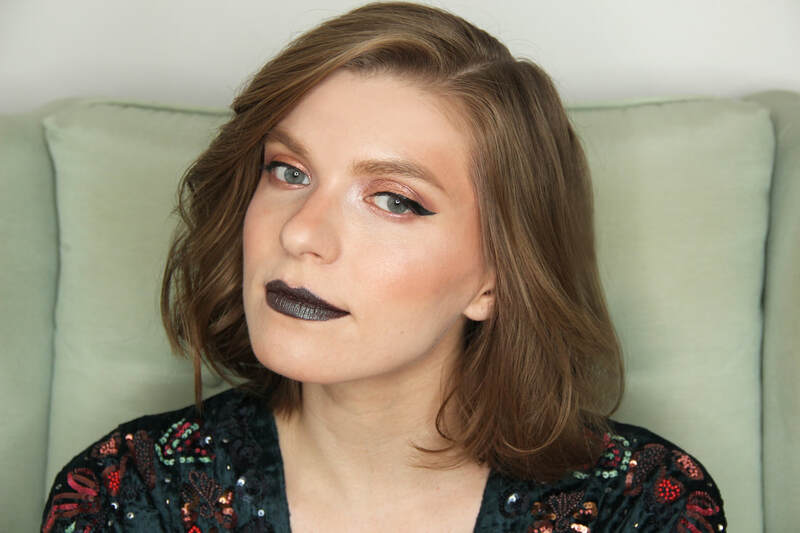 The formula of both matte and metallic shades is lovely, and very buildable. 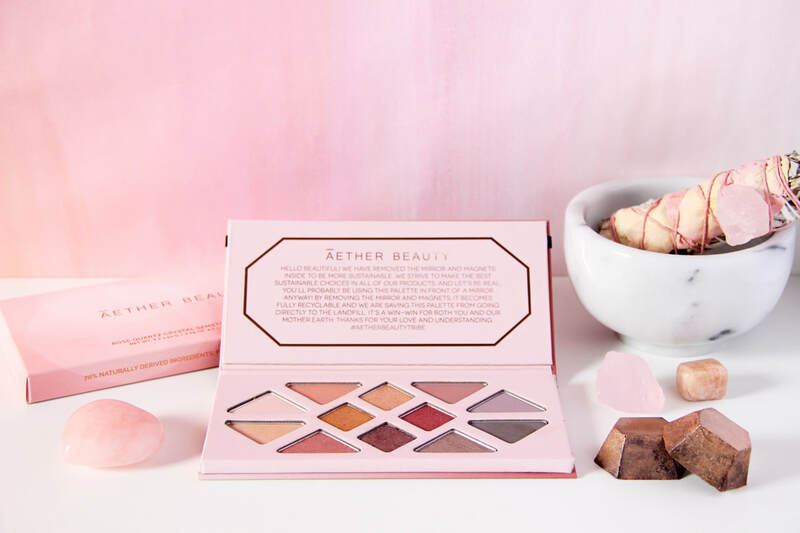 It is clear a lot of thought went into making this palette. The Necromancy Cosmetica Summer Dying Fast Collection, $45, includes 3 lipsticks in "unusual summer shades perfect for every witch". 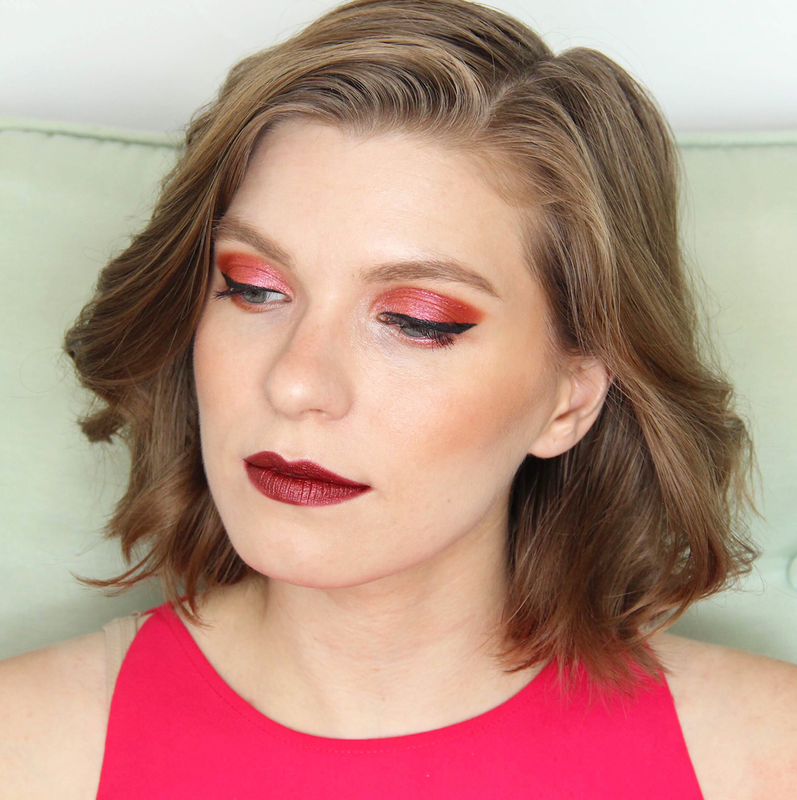 In my Velma look above, I layered "Mourning Rose" and "Solis Mortem". I have several other lipsticks from Necromancy Cosmetica and they are all consistently wonderful and long-lasting! I feel like I say this a lot, but this has got to be one of my favorite recipes I've ever made! The texture is just right and with the added flavor from the pistachios, not a single soul will be able to refuse a bite of these cookies. ​This recipe is adapted from a recipe for "Pumpkin Spice Oatmeal Cream Pies" by Mary-Kate Lynch. In a medium bowl, sift together flour, baking soda, salt, cinnamon and matcha powder. This is the dry mixture. In a separate bowl or standing mixer, combine applesauce, 1/2 cup vegan butter, sugar, brown sugar and vanilla. Slowly add in in the dry mixture, then fold in the oats and optional pistachios with a spatula. Jinkies this dough is delicious. Scoop tablespoon-sized balls of dough onto the lined baking sheet. For flatter more even cookies, press down lightly on each ball of dough with the bottom of a cup or a large spoon. Bake for about 10 minutes and let cool completely before removing from the pan. For the cream filling, beat together the remaining 1/2 cup of vegan butter with 2 cups powdered sugar, to taste. Feel free to add another spooky natural colorant like turmeric, beetroot powder, spirulina or even charcoal. I kept mine simple. Once the cookies are cool, spread or pipe cream filling in between two cookies and then, hold the phone, they're done! Lastly, for the zombie eyes, I used the same technique I used for my Halloween Cutout Cookies last year. Cut mini vegan marshmallows in half (kitchen scissors are great for this) and squish in mini chocolate chips for the pupils. Attach the marshmallow eyes to the cookies with a dot of the cream filling. Enjoy! 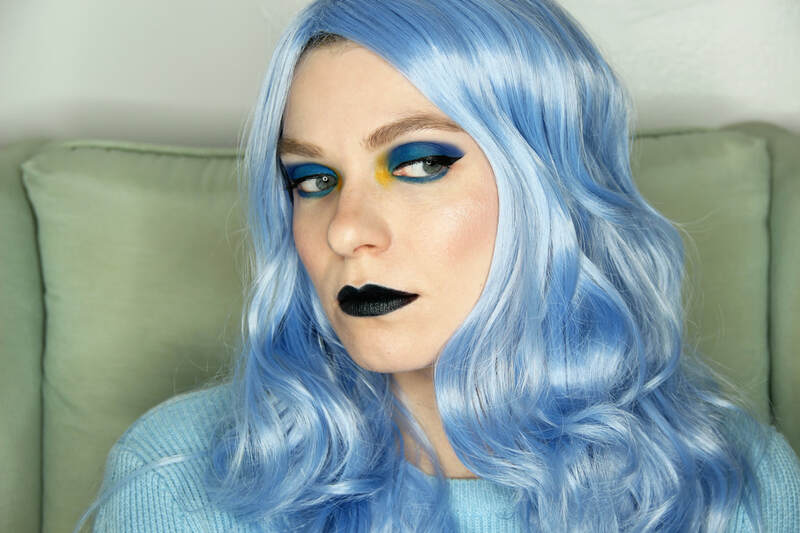 In my lofty goal to try the indie vegan and cruelty free makeup brands, Lunatick Cosmetic Labs has been on my radar for a while. I figured this would be the perfect time of year to share my thoughts on some of their products. 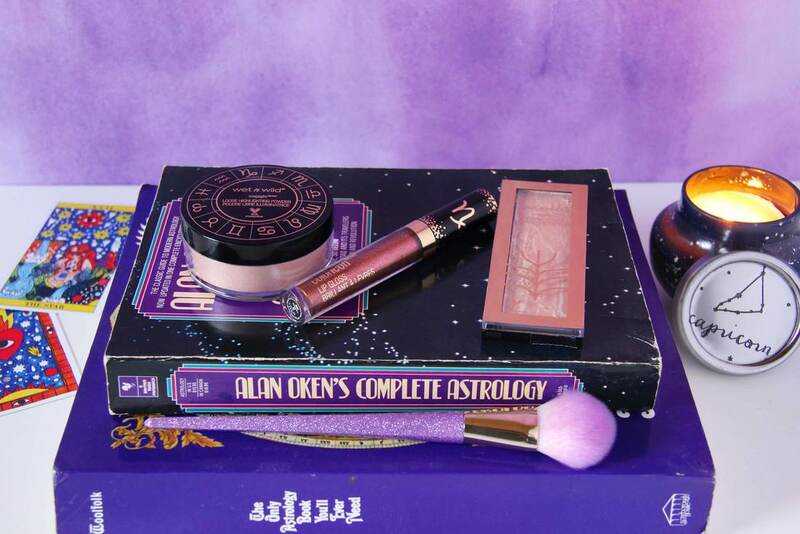 The Vampira Palette is so much fun, I mean look at that packaging! And its deadly neutral shades are perfect for year round. Feeling hollow? Look out below to find the recipe for the little chocolate cupcakes in the corner of this photo. Eyes: Lunatick Cosmetic Labs Vampira Palette. Lips: Lunatick Cosmetic Labs Lipstick in "Calabaza". The Lunatick Cosmetic Labs Vampira Eyeshadow Coffin Palette, $35, contains 5 eyeshadows in a variety of ghoulish shades ("Velvet Moon", "Untarnished", "Astro Vamp", "Necromancer" and "Nefarious"). None of the shades are truly matte, and the formula varies in intensity. That being said, I LOVE the way these eyeshadows look on the eyes and they wear beautifully throughout the day. The lipsticks are $15 and come in a fun metallic bullet cartridge. I tried the shades "Calabaza" (a roasted pumpkin orange) and "Lacrimosa" (translucent pink shade with kaleidoscope color shift) which are both stunning and super smooth. 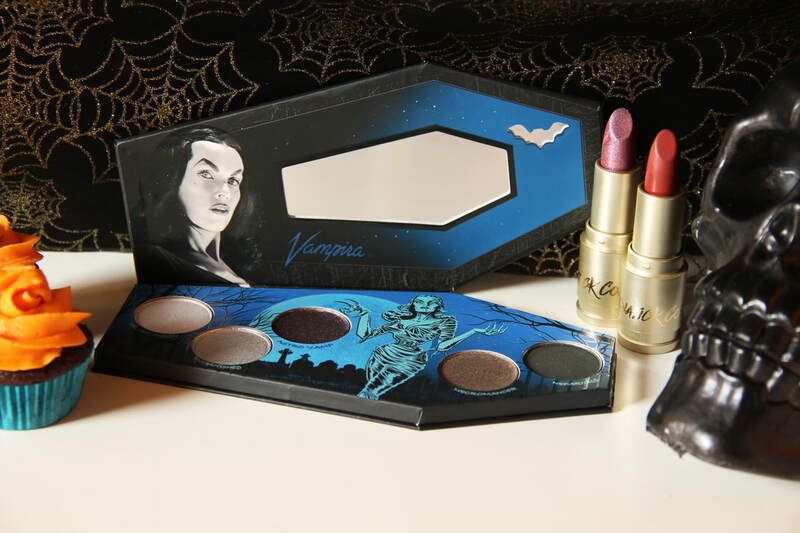 Lunatick Cosmetic Labs also has a colorful Elvira, Mistress of the Dark Eyeshadow Coffin Palette, and I'm really hoping they come out with one for my favorite spooky TV dame, Lily Munster! Can there ever really be enough cupcake recipes on this blog? I think not. Preheat the oven to 350°F. Line a mini muffin pan with paper liners (I used primary blue to contrast the orange frosting). In a large bowl, sift together flour, cocoa powder, salt and baking soda. This is the dry mixture. In a separate bowl or standing mixer, combine light brown sugar, granulated sugar, applesauce, vegetable oil, non-dairy milk and vanilla. Slowly incorporate in the dry mixture until smooth. Optionally, stir in chocolate chips for added texture and richness. Pour batter into cups. Bake for about 15 minutes, until a toothpick inserted into the center of the cupcakes comes out clean. Allow to cool completely before frosting. As for the frosting, combine powdered sugar and vegan butter. Optionally, add in natural food coloring. For fancy swirls as pictured, pipe on frosting with piping bag and large star tip. Otherwise, opt for a low maintenance approach and spread frosting on with a knife. Feel free to top with sprinkles, chocolate chips, cookies crumbs or candy. Enjoy! 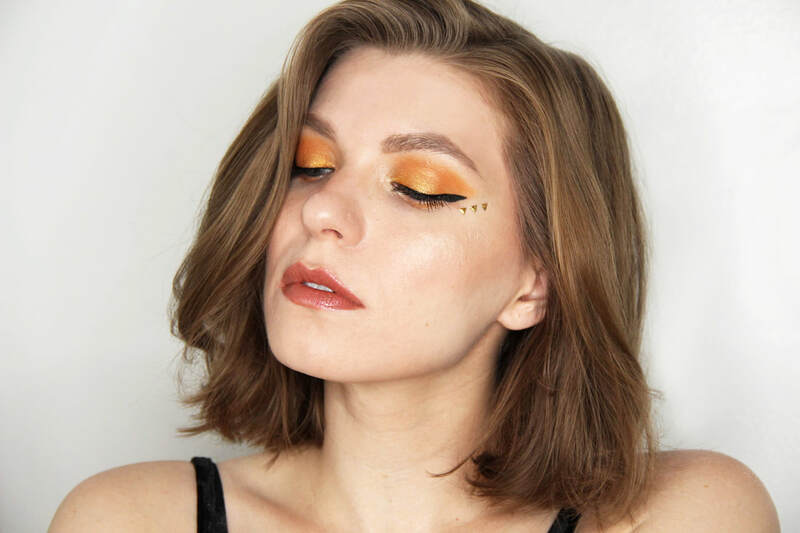 Makeup Monsters is an indie vegan and cruelty free makeup brand with tons of fun colorful products, including their first ever eyeshadow palette, Dragon Child. 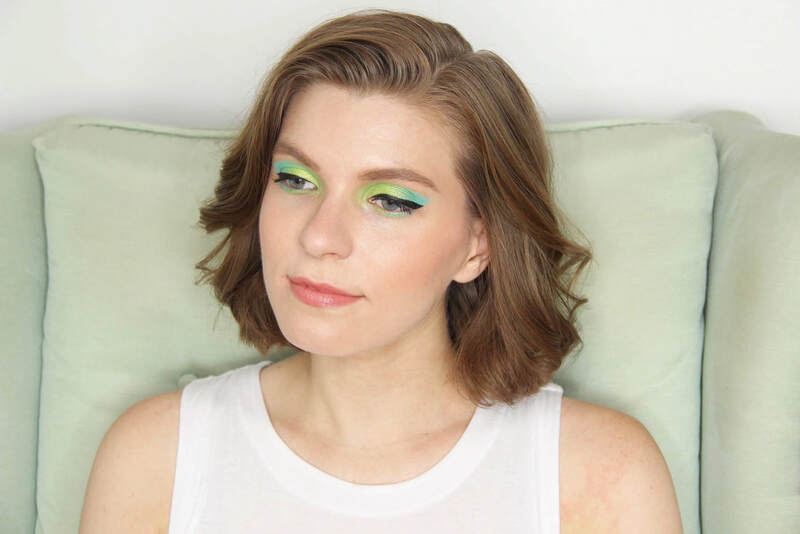 In the palette, the shade "Dragon Child" is Baja Blast perfection, so I created an accompanying recipe using the cult classic Mountain Dew Baja Blast. Scroll down to find out how to make these radical cupcakes. The Makeup Monsters Cosmetics Dragon Child Eyeshadow Palette, $42, includes 12 eyeshadows (10 matte, 2 metallic), all inspired by dragons. The colors are all incredibly vibrant and pigmented, and I'm excited to have it in my arsenal! 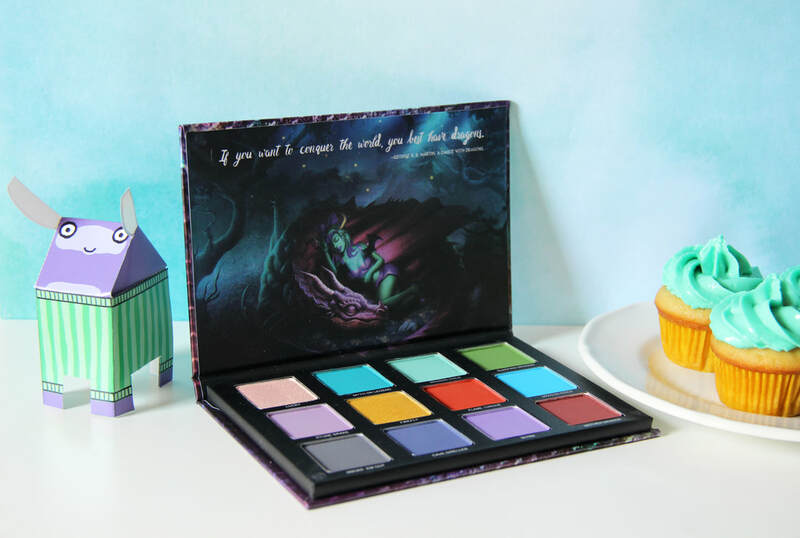 Eyes and Face: Makeup Monsters Cosmetics Dragon Child Eyeshadow Palette. Lips: Atomic Makeup Disco Gloss in Knee-Highs. I wouldn't normally be drawn to a palette with so many cool toned shades, but the color story is so beautiful and unique. It encourages playing with new and different combinations and thinking outside the box, which I love. 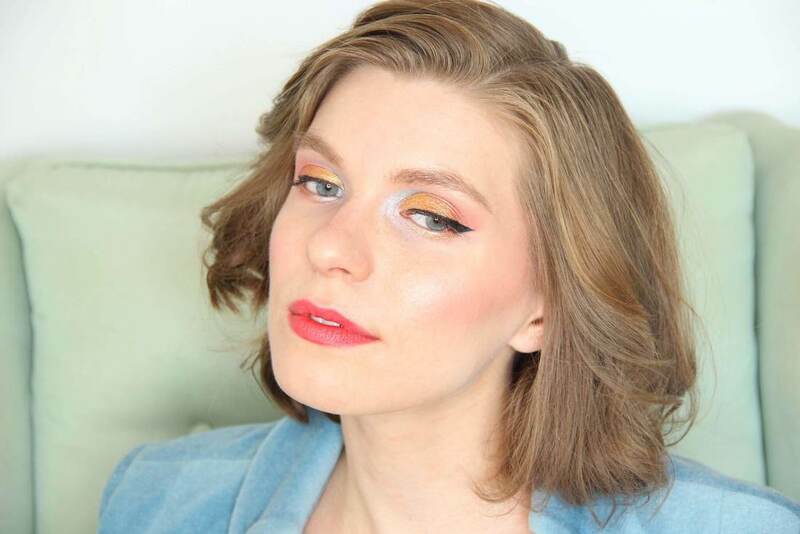 The shade "Lucky" doubles as the most stunning duochrome highlighter, and "Firefly" is a lovely pop of color in the inner corner of the eyes. 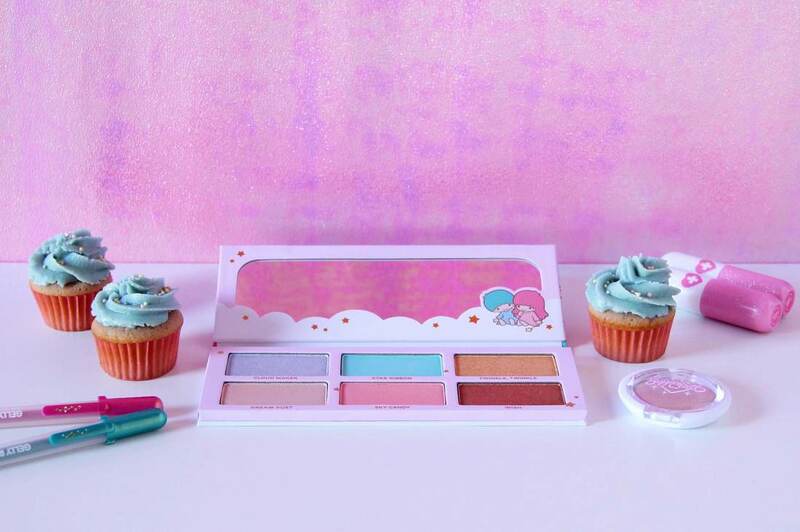 Overall, I look forward to creating new looks with this palette and I can't wait to see what Makeup Monsters Cosmetics comes out with next! Get caught in a "tropical lime storm" with these cupcakes! Preheat oven to 350°F. Line a mini muffin pan with paper liners (I went for a classic Mountain Dew yellow). ​In a large mixing bowl, sift together the dry ingredients (flour, baking soda, baking powder and salt). Set aside. In another bowl, cream together 1/2 cup butter with sugar, and gradually add in applesauce, sour cream, Baja Blast and most of the lime zest until incorporated. Slowly add the dry ingredients mixture into this mixture until smooth. Spoon slightly less than a tablespoon of batter into each mini muffin cup. Bake for about 15 minutes, until a toothpick inserted into the centers comes out clean. Hang ten while the cupcakes cool in the pan, then remove to a rack while you prepare the frosting. If you want your cupcakes to be totally tubular, don't frost em while they're hot. For the frosting, using a standing mixer or hand mixer, whip remaining 1 cup butter, gradually adding in powdered sugar through a sifter until smooth and creamy. Bring it to the next level with remaining lime zest, a tiny splash of lime juice, vanilla, and either spirulina powder or natural teal food coloring for the perfect punch of cowabunga color. Once the cupcakes are cool, add on some frosting. I recommend using a piping bag and large star tip, or simply spreading frosting on with a knife. Enjoy!